Now is the time to start looking into which trends are going to be hitting the fashion industry this fall, including hairstyles. Fall brings a whole new look; from leggings and sweaters to lowlights and bangs. We’ve done some research to find exactly what is trending in the hair industry as the seasons begin to change. Not just any bobby pins, though. Pin your curls with jewels, colors and unique bobby pins this fall to show off your personality in your look. 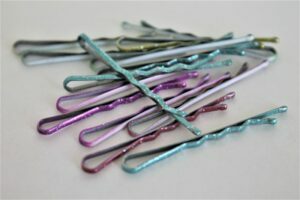 Although neutral-colored bobby pins are great for tucking in flyaways, this season is all about using your hair clipping accessories as a statement, rather than a solution! The bolder, the better! If you think about it, most celebs have been rocking the middle part in their hair recently. This trend has made its way across the nation and sees no sign of leaving any time soon. Make your straight hair sassy by adding this bold look to your rotation! Thanks to Pinterest, people have been experimenting with their curls a lot lately. The finger wave is taking that to the next level. Get ready to go vintage with this look that is a classy compliment for any outfit and makes an especially great look in a professional atmosphere. Other trends that are on the rise as fall approaches include the slicked-back look, the messy bun, headbands and claw clips. We can’t wait to use our knowledge of these trending styles and make our clients look absolutely fabulous this fall! Ready to get your luscious locks ready for the fall foliage? Now is the time to start; book an appointment with us today!